NEW YORK (CNS) — With so much TV content available in our online era, viewers may inevitably overlook something worth their investment. They certainly shouldn’t ignore writer-director Vanessa Roth’s remarkable documentary “Daughters of Destiny.” Released July 28, its four one-hour episodes are streaming now on Netflix. “Daughters of Destiny” contains nothing objectionable. But its themes of poverty, racism, sexism, suicide and domestic violence make the film most suitable for adults and mature adolescents. 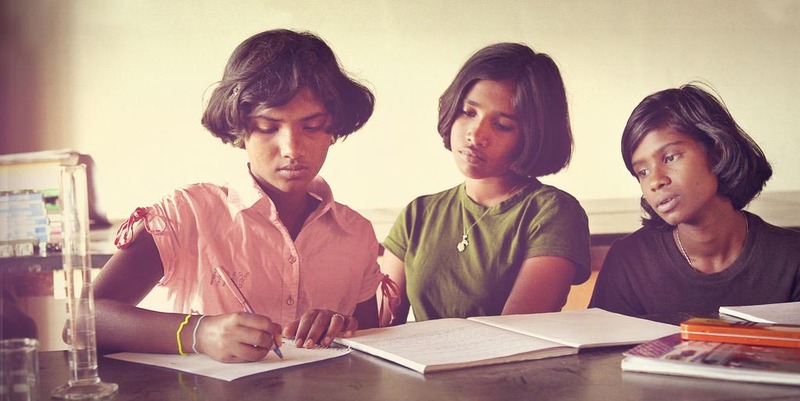 Shot over seven years, “Daughters of Destiny” explores the Shanti (peace) Bhavan (building of purpose) residential school in Tamil Nadu, India, and its impact on the lives of five young women who are so-called “untouchables” on the lowest rung of that nation’s notorious caste system. Born in India, and now living in Boonton Township, New Jersey, entrepreneur Abraham George sold his business to a Fortune 500 company in the 1990s and used the proceeds to establish the home and school for kids from kindergarten through the 12th grade. Determined to end 1,000 years of suffering for these children, and lift them out of poverty, George believes he has found a way to do so. His recipe combines excellence in education with a program that instills leadership in the students and helps them to strengthen their characters and cultivate their interpersonal skills. Still, in a country where 275 million people live on less than $2 a day, helping anyone escape poverty is an enormous challenge. In the Shanti Bhavan approach, which concentrates on educating poor children with the potential to achieve, Catholic viewers may see some similarities to Jesuit Academy middle schools and Cristo Rey high schools. George hopes his students will help at least 100 more kids each, maybe 1,000 more. That multiplying effect, he believes, will make a larger dent in India’s generational poverty. The film gets off to something of a slow start, as interviews with George establish the school’s background, history and philosophy. But as Roth hones in on the young women “Daughters of Destiny” studies, the film re-engages viewers and consistently fascinates them. One of the older ex-students profiled, 2011 graduate and aspiring journalist Shilpa offers evocative reflections, which frame each episode. Like the other women the film portrays, Shilpa is caught between the world she knew as a girl, and her aspirations for very different kind of life, which her Shanti Bhavan experience encouraged her to pursue. To attend the school, Shilpa defied her grandmother’s wish that she marry her uncle. “Daughters of Destiny” is at its best describing the tension and ambivalence these women experience when they return home. This is exemplified in the story of Karthika, an intense alumna — also from the class of 2011 — with whom the audience will likely identify. Now an attorney, Karthika tries to use her legal skills to help her family and neighbors. They have been consigned to a lifetime of hard, dirty work busting rocks in her hometown’s quarry. Karthika hopes that by gaining control of the land on which the quarry stands the workers will be able to improve their situation. This intriguing documentary enables viewers to encounter people they wouldn’t otherwise meet, yet with whose struggle they will surely sympathize. It’s an enriching experience, though it raises the question why the Shanti Bhavan model can’t be replicated more widely to help a greater number of the 300 million untouchables who continue to be oppressed by the caste system. Perhaps “Daughters of Destiny” will become a catalyst to make that happen. Shanti Bhavan is doing fine. “Daughters of Destiny” is showing the way.